Good morning, dear friends! Today, I am so excited to share my living room all decked out for the Christmas season. This is such a special time of year! I have so much to be grateful for, and my heart is filled with so much joy and happiness. Those of you, who follow my blog, know that this is my first Christmas in the house. It has been so much fun decorating a new space for the holidays. As I unpack each box, I find the special memories are still alive, and I treasure each one. This holiday tour is being hosted by the sweet Chloe at Celebrate and Decorate and features several other talented and creative bloggers. A schedule is posted below. The living room tree is a traditional one filled mostly with religious ornaments, ribbon, and colored balls. Another tree, in our sunroom, houses our special memory ornaments along with decorations made by my children. The mantel is the perfect spot to hang our Santa picture. Around here, he is a tradition. Embellished garland, bows, red candles, and berries complete the festive look. The coffee table serves as a snack station for watching holiday movies. Therefore, I kept the decor to a minimum with an arrangement of greens and berries, candles, and a pretty dish. You may notice someone extra in the picture. That is our poodle, Rusty. He follows me everywhere I go. I didn’t realize he made it to the picture until I was putting this post together. Greens with pretty red ribbon are placed around the room. I am so happy that you stopped by for the tour! It has been so much fun getting my home ready for the holidays. Be sure to visit the other bloggers on the tour. I know you will find lots of beautiful inspiration for your holiday decorating. Take care, and enjoy you day, sweet friends! Your tree is looking very grand and majestic flanked by your two beautiful blue chairs! I like how all the blue ties in, even the Santa picture with the blue in his globe. You have created a gorgeous room to celebrate Christmas. Beautiful!! Your new house is really becoming a Home for the Holidays! Lovely, Shannon! Beautiful decorating for your new home. Shannon, your living room is beautiful. Your room is bright and airy with huge windows to bring in the light which I love. The Christmas tree is majestic in the center of the picture window flanked by your beautiful french chairs. I love how you paired your blue and white with red for Christmas. Your tree is decorated so pretty. I love your ornaments. Beautiful Shannon, and I almost missed Rusty and yet I still had to look twice. He blends in. 🙂 I love the traditional Christmas you portray. It could be . Hallmark picture. Good job! Your home looks beautiful! The garland on the fireplace is so beautiful and I wish I could make mantel as pretty as yours. I have a Santa over my fireplace this year so I love that Santa. You have done a great job decorating your home. Shannon, your living room is gorgeous! I love the wall of windows and the beautiful wood floors. These are favorite details for me! I can just imagine how exciting it is to be in a new home, decorating it for the first time. I smile just thinking about it! Your decorations are perfect for your space. I pinned your greens with the pretty red ribbon. I want to remember to do that myself. Merry, Merry! Your home looks beautiful for the holidays! I love the combination of red and blue! This is an amazing blog hop full of inspiration!! Shannon, your living room is beautiful! The tree is stunning in front of your windows and the blue in your room is perfect, from the chairs, to your blue/white collection, to the blue ornaments on your tree. Santa over the mantel adds a sweetness to your gorgeous traditional decor! 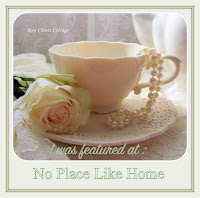 I know you are enjoying decorating your new home…it is so lovely! I can’t wait to see more, my friend. Your room is gorgeous! I love all the blue ornaments on your tree. Merry Christmas season! Oh wow, Shannon, you’ve done classic blue & white with a perfect mix of red and green! That red rug grounds it all, no matter what season, but your holiday decor looks beautiful! That’s a traditional look I could certainly love to live with! It makes me wish for more blue in my home. Happy Holidays! Your room is just the right setting for your festive decorations. What a pretty room with all those windows and French doors and the Christmas decorating you’ve done has added to its charm. The blue and white with pops of red look wonderful on your tree and your mantel with that Santa pic is perfect. I especially like your furniture and how you’ve placed it in the room – the blue chairs by the tree and the lovely round coffee table. I love your traditional Christmas. My home has a lot of blue, so I waffle between burgundy and red for Christmas…I really love all your photos. Your home is so pretty! I love your gorgeous tree and I love how the blues go with the blue chairs. Your new home is so lovely. Your living room looks so welcoming for Christmas! Hi to Rusty, too! I love the traditional look to this room, perfect for the holiday! Thank you so much for being part of another blog hop, and Merry Christmas! Beautiful Christmas decor. I love the red and blue scheme– so cheery! I love your decorator tree. Our tree is like the one on your sunroom but I am thinking about getting a small artificial tree to coordinate with the rest of my decorations.